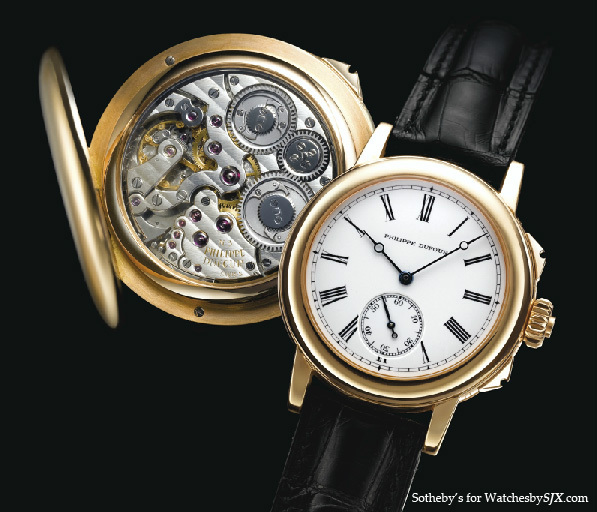 The Philippe Dufour Grande Sonnerie wristwatch and pocket watch which I wrote about here a few weeks ago, just hammered at Sotheby’s Hong Kong auction for handsome prices, reinforcing Mr Dufour’s status as a pre-eminent independent. The grande and petite sonnerie wristwatch in rose gold, serial no. 3, sold for the substantial price of HKD4.82 million, or about USD621,000, inclusive of buyer’s premium, well above the estimate of HKD2.2-3.2 million, which works out to about USD283,000-412,000. Incidentally another Dufour grande sonnerie wristwatch with a skeleton dial recently changed hands privately as well, but unfortunately that transaction price is private as well. That compares very well with the earlier sale of a similar white gold Dufour grande sonnerie wristwatch which sold at Christie’s in 2008 for CHF437,000, or about USD477,000 at today’s rates. I won’t be surprised if the price continues to climb at future sales, given there are only six or seven Dufour sonnerie watches out there. The pocket watch on the other hand sold for HKD1.34 million, or about USD173,000, including the premium. That is well within the estimate of HKD1.0-1.5 million, which is USD128,800-193,200, and also quite a bit less than the wristwatch, which is not surprising given the relative appeal of wristwatches. Mr Dufour is one of the few independent watchmakers who creations sell for higher prices on the secondary market as compared to the original retail price. It would be interesting to see how a Philippe Dufour Simplicity, which is Mr Dufour’s quintessential and perhaps iconic timepiece, does at auction. Though they change hands fairly regularly, though not often, on the secondary market, a Simplicity has yet to appear at auction.